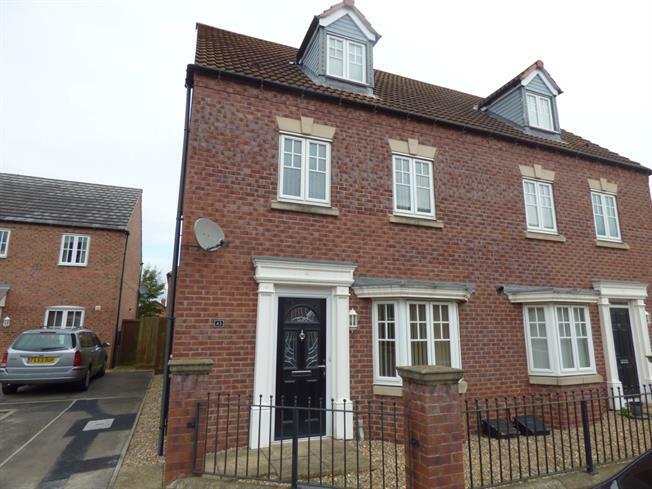 4 Bedroom Semi Detached House For Sale in Wigston for Guide Price £240,000. Spacious four bedroom family home offering living accommodation over three floors. Located in a cul de sac on the Oadby Wigston border. The property briefly comprises of entrance hall, living room, kitchen diner, downstairs WC, the first floor offers three bedrooms and a family bathroom. The master bedroom occupies the top floor with shower room en-suite and plenty of fitted storage. Externally there is a single detached garage, off road parking and both front and rear gardens. Fitted wall and base units, stainless steel sink with mixer tap, integrated oven, gas hob, overhead extractor, integrated dishwasher, space for fridge freezer and dining table, double glazed window to front, radiator. Double glazed patio door, double glazed window overlooking the garden, radiator. Double glazed window facing the rear. Radiator, fitted wardrobes. Double glazed window facing the rear. Heated towel rail. Low level WC, single enclosure shower, pedestal sink. Radiator, low level WC, roll top bath with mixer tap, pedestal sink with mixer tap.